Hope, the above description has given an idea about the satellite phone to all who are unaware about it. Tell me your reaction if I say “you can convert your iPhone or Android phone into a satellite phone.” Yes you read it correct, now you can convert your Smartphone into a satellite phone and that also by just sliding it into a case. 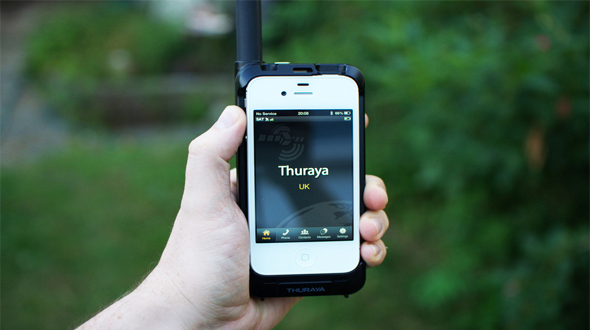 Just slide the Thuraya SatSleev and Bingo, your normal Smartphone will become the Satellite phone. In addition to offering support for calls and SMS messaging, the latest SatSleeves also have satellite data functionalities for emails, instant messaging, browsing and so on. Yes, calls and data are going to cost you a many of your daily needs (don't be surprised if it adds up to several dollars a minute depending on where you want to use your handset). But for those times when you just have to make - or receive - that call, nothing beats a satellite phone. The SatSleeve also features a built-in rechargeable battery, which will help you to extend the battery life of your Smartphone. If you are planning to buy SatSleeve then it is going to cost you $499 (approximately).